How to add Toggles at your page/post? To add toggles to your page/post press the “Insert Toggle” shortcode button, that can be found integrated in default editor panel in visual mode like in the image. Toggle’s settings comes with simple text field, where you can fill in title and dropdown menu, where you can select the type of your toggle. “Type of toggle” dropdown menu allows you to set the color of your toggle. It can be white or gray. 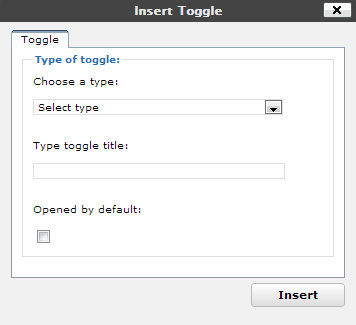 “Opened by default” checkbox allows your toggle to be opened or not by default.